Rakesh Chandra, Edward W Fisher, Terry M Jones, David W Kennedy, Dennis H Kraus, John H Krouse, Michael Link, Lawrence R Lustig, Bert W O'Malley, Jay F Piccirillo, Robert Ruben, Robert T Sataloff, Sandra Schwartz, Raj Sindwani, Richard J Smith, Michael G Stewart, Peter C Weber, D Bradley Welling, Robin Youngs,	The Journal of Laryngology & Otology, Volume 132 Issue 3, pp 189-190. P Surda, A Walker, J Limpens, W Fokkens, M Putala,	The Journal of Laryngology & Otology, Volume 132 Issue 3, pp 191-197. J Lau, H A Elhassan, N Singh,	The Journal of Laryngology & Otology, Volume 132 Issue 3, pp 198-201. J S Phillips, J Fitzgerald, D Phillis, A Underwood, I Nunney, A Bath,	The Journal of Laryngology & Otology, Volume 132 Issue 3, pp 202-206. R Nash, R K Lingam, D Chandrasekharan, A Singh,	The Journal of Laryngology & Otology, Volume 132 Issue 3, pp 207-213. G M Oakley, J M Christensen, M Winder, B P Jonker, A Davidson, T Steel, C Teo, R J Harvey,	The Journal of Laryngology & Otology, Volume 132 Issue 3, pp 214-223. P Mittmann, A Ernst, I Todt,	The Journal of Laryngology & Otology, Volume 132 Issue 3, pp 224-229. 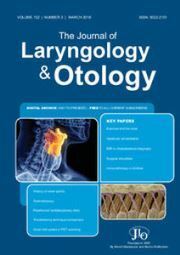 Y Song, J Long, T Wang, J Xie, M Wang, G Tan,	The Journal of Laryngology & Otology, Volume 132 Issue 3, pp 230-235. F G Kavanagh, W Hasan, D A Smyth, J E Fenton,	The Journal of Laryngology & Otology, Volume 132 Issue 3, pp 236-239. D Wiltshire, M Cronin, N Lintern, K Fraser-Kirk, S Anderson, R Barr, D Bennett, C Bond,	The Journal of Laryngology & Otology, Volume 132 Issue 3, pp 240-245. P Sittitrai, C Srivanitchapoom, D Reunmakkaew,	The Journal of Laryngology & Otology, Volume 132 Issue 3, pp 246-251. S H Hancox, J D Sinnott, P Kirkland, D Lipscomb, E Owens, D C Howlett,	The Journal of Laryngology & Otology, Volume 132 Issue 3, pp 252-256. S Wijewickrema, Y Zhou, I Ioannou, B Copson, P Piromchai, C Yu, R Briggs, J Bailey, G Kennedy, S O'Leary,	The Journal of Laryngology & Otology, Volume 132 Issue 3, pp 257-263. A C Coombs, A Butler, R Allison,	The Journal of Laryngology & Otology, Volume 132 Issue 3, pp 264-269. N Seymour, G Burkill, M Harries,	The Journal of Laryngology & Otology, Volume 132 Issue 3, pp 270-274. D Cox, L Chan, D Veivers,	The Journal of Laryngology & Otology, Volume 132 Issue 3, pp 275-278. D Mulvihill, R S Kumar, J Muzaffar, R Irving,	The Journal of Laryngology & Otology, Volume 132 Issue 3, pp 279-281.